Walking along Soyanggang Skywalk at night, Ha-Ra thanks Do-Chan for changing Joon-Soo’s plan so that he could have a chance to live. She ponders out loud that maybe Joon-Soo thought he would die and wanted to ensure Prosecutor Baek Joon-Soo would remain, even if it was Sa Do-Chan. Do-Chan says it is scary to think about living as Joon-Soo forever. Hoping that Joon-Soo's surgery goes well, Ha-Ra tells Do-Chan that he is a good person. When Do-Chan questions why she said this all of a sudden, Ha-Ra playfully jokes that he was able to hear his own praises before. Seriously she tells Do-Chan that she is grateful that it was he who was pretending to be Joon-Soo, as she doesn’t know if she could have made it this far without him. Do-Chan raises and points his finger at her, with a grin from ear to ear says, "Do you meant it?” Taking this opportunity to return some of Do-Chan’s cheekiness, Ha-Ra sticks her tongue out at him and walks off chuckling. Meanwhile having already being prepped for surgery, Baek Joon-Soo is taken into theatre. The following morning on his way up the buildings stairs, Investigator Go is approached by two prosecutors from the Internal Affairs division. Hearing those two most hated words amongst civil servants - internal affairs - Go’s heart rate suddenly accelerates. Co-operating with them, Go follows them into an interview room. His hands shaking, Go manages to take a sip of water from his cup. Regardless whether you are innocent or not, no words need to be spoken when there are Internal Affair officers present. They are so intimidating! Referencing the time Go investigated the true identity of Baek Joon-Soo, they ask Go whether he found anything strange during his investigation of Baek. Placing the fingerprint results Go obtained on the table, one of the officers concludes that Go must have had reason to suspect Baek was an imposter in order for him to obtain the fingerprints. Why did Go suspect Baek Joon-Soo was a fake? Knowing full well he has to be careful of what he says to the officers, Go swallows his pride and admits that his suspicions were based on Baek’s personality. He is too nice. Baek Joon-Soo is very thoughtful and different from other prosecutors. The officers, not quite sure what to make of Go’s comments, demand to know if he knew that Do-Chan was pretending to be a prosecutor. Feeling under pressure and now knowing that Do-Chan was impersonating Joon-Soo, Go answers yes, he did know but quickly says no. Knowing how much their presence intimidates Go, they push him further ensuring Go knows that if he is involved in this scandal, his career is on the line. Recently discovering just how much corruption there is within the prosecutions office, Go is frustrated that the officers imply that he should trust them and tell them the truth. Go slams his fist on the table as he stands up and yells, “Trust people, will you?”. Looking down into the officers faces, Go tells them that Baek Joon-Soo is a great person. Feeling the courage inside him grow, Go offers to quit his job if that is what they want. Investigator Go returns to their interrogation room where Do-Chan waits for him. Seeing the state Go is in, Do-Chan is worried about his friend. Go tells him that, although he has signed the routine confidentiality agreement with them, he feels he has to warn Do-Chan. He was questioned by Internal Affairs! Alarmed, Do-Chan says nothing. During the day, Do-Chan meets with Choi Jung-Pil at a tea house. Choi tells Do-Chan that, given his age, he may not live long and wants to see Geum Tae-Woong caught and prosecuted before he dies, even if he spends his last days in jail. Do-Chan reveals the purpose of this meeting: to ask for any details on Geum Tae-Woong, since Manager Kim is still not talking. 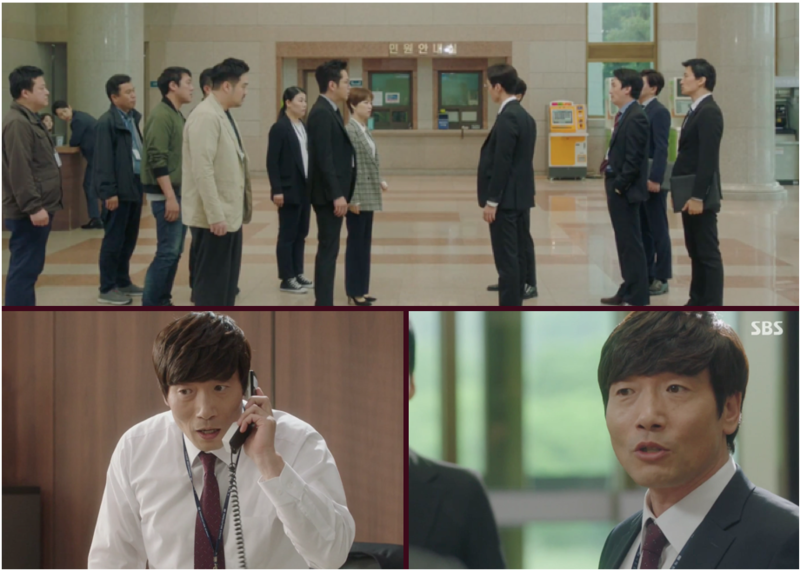 Do-Chan asks Jung-Pil if Secretary Kim and Tae-Woong used burner cell phones. Jung-Pil says he knows where the phones came from, a phone shop owned by Mr Yoon, in Yeongdeungpo. If Do-Chan goes there, he can learn the phone numbers used by Kim and Tae Woong. Do-Chan tells Choi he has been a big help. Do-Chan calls Ha-Ra on her cell phone which she answers in her car. Conveniently, she's stopped at a red light intersection. Ha-Ra says she is on the way to Yeongdeungpo now to get the cell phone numbers. She marvels at how Do-Chan was able to get the information from Jung-Pil. Do-Chan boasts that it is not his fault that he is everyone’s favorite, despite age or gender. Chuckling at his reply, Ha-Ra’s attention is suddenly diverted to a dump truck traveling in the opposite direction. Instead of staying in its own lane, the truck heads straight towards her! Realizing the truck is not slowing down and a collision imminent, Ha-Ra raises her arms to shield her head. The truck slams into Ha-Ra’s car head on. Losing the phone connection with Ha-Ra, Do-Chan instantly grasps something is terribly wrong. Running through the hospital, Do-Chan discovers Ha-Ra is being taken from the Emergency Department up to surgery. Do-Chan briefly manages to see the unconscious Ha-Ra before she's wheeled into surgery. The attending nurse tells him to wait outside. Horrified at Ha-Ra’s vulnerability and the prospect of losing her, Do-Chan and Chief Yang join So-Ra and her mother, waiting for any news on Ha-Ra’s condition. Investigator Go and the Officer Lim arrive. They discovered that an intoxicated homeless person was driving the truck, which makes no sense at all. Knowing all too well that Geum Tae-Woong is behind this so-called accident, Do-Chan angrily strides away to go confront Tae-Woong. Sensing Do-Chan’s desperation, Go catches up and stops in front of Do-Chan, blocking his path. He tries to talk Do-Chan out of it, saying he knows how he feels, but Do-Chan tells him he has reached his limit. Go pleads with Do-Chan not to give up on everything they have worked for. Chief Yang, who has now also caught up with them, agrees with Go. 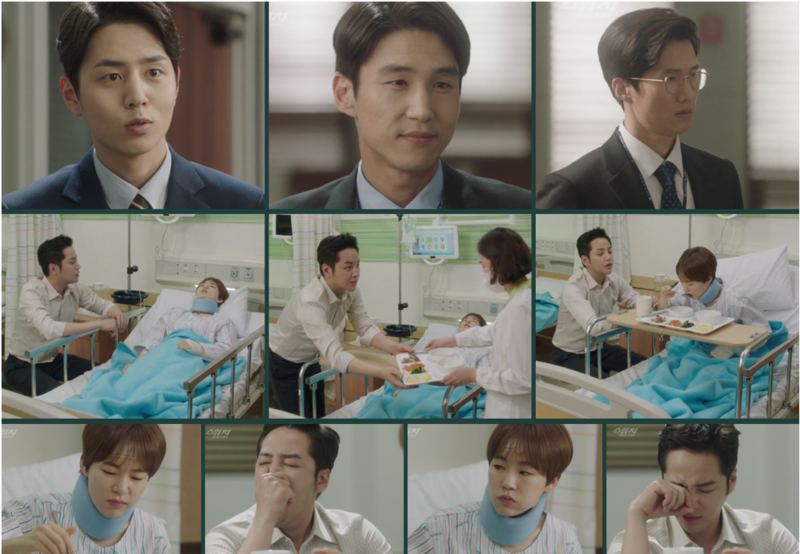 The chief tells him that with Ha-Ra in a serious condition, if something happens to him, they will have no hope of catching Geum Tae-Woong. They did not come this far to lose everything now and they cannot stoop to his level. They need to follow the law and let the law catch Geum. Standing beside his record player, Geum Tae-Woong caresses his ego with Strauss’s Radetzky March. Fitting, as this piece of music was composed to commemorate Radetzky’s victory at battle. Geum, satisfied with his current victory regarding Ha-Ra’s accident, tells himself, “That should suffice as a warning”. Back at the office, everyone goes back to work, determined not to allow Geum’s intimidation overcome them. Do-Chan tells the team they need to find more solid evidence. They need to find proof that Geum actually instigated the murders. He asks Officer Lim to re examine the autopsy reports of those that were killed by Geum’s orders and tells Investigator Go to search through the phone records and look for any patterns. If they can find anything to link Manager Kim, they can put more pressure on him in the hope of making him talk. Waking up in the hospital bed, Ha-Ra recognizes her mother and sister sitting next to her. The doctor comes in and tells her that considering the seriousness of the accident, she has not suffered any major injuries just a small hairline fracture in her elbow. Just as the doctor tells them that Ha-Ra will be fine, Do-Chan enters the room, relieved to see Ha-Ra awake. After Ha-Ra’s mother and So-Ra go home to rest, Do-Chan sits beside Ha-Ra’s bed, fighting with tiredness himself. Waking from sleep, Ha-Ra catches Do-Chan looking exhausted and tells him that she is fine, that he should go back to work and show Geum that they are not frightened by him. Jokingly, Do-Chan comments that if he did that, people will think he really is a prosecutor. Trying not to laugh, Ha-Ra states that right now he is the closest thing to being one. Coming out from his office, Gil Dae-Ro is quickly pounced upon by the two officers from Internal Affairs. Despite his superiority complex, Dae-Ro confesses to a few misdemeanors without thinking. Telling him they are not interested in his minor offenses, the officers want to know how much Gil knows abut the fake prosecutor Sa Do-Chan. Relieved and wanting to help incriminate Baek Joon-Soo, Gil eagerly goes with the officers to their interview room. They ask Gil if he had suspected the imposter and on what grounds. Revealing to the officers that he did initially have his suspicions, he was proved wrong and humiliated in the process. Gil explains about Joon-Soo baring his scar in front of the his colleagues. Despite his scar, they ask Gil if he noticed any other strange thing about him, and Gil reflects on his encounters with Joon-Soo and Ha-Ra. The incident at the park when Ha-Ra asked him if he had been to law school and again at the prosecutors meeting when Joon-Soo responded to a hush case in a humorous way. Suddenly, Gil leans forward on his chair, closer to the officers. Meanwhile at the hospital, Ha-Ra’s meal arrives. Still wearing a neck brace, Do-Chan quickly lifts the bed table into a position where Ha-Ra can reach it and takes the dinner tray from the catering staff, placing it on the bed table. Next, Do-Chan raises the head of the bed, allowing Ha-Ra to sit upright until Ha-Ra gives him the okay signal when to stop. She asks for some water to which Do-Chan promptly pours for her in a cup. Seeing Ha-Ra eagerly feed herself, Do-Chan smiles happy that she is on the mend. Suddenly tiredness hits Do-Chan and he fails to suppress a yawn. Saddened by the awareness of all that Do-Chan has done, Ha-Ra continues eating while Do-Chan leaves to get some well earned rest. Later on Investigator Go and Officer Lim visit Ha-Ra who is sitting up in bed, clearly looking much better. They brought her some work she requested and jokingly tease her. Both are much relieved to see she's on the mend. After work, Do-Chan again sits with Ha-Ra but this time they go through some paperwork. When she tries to clean her own glasses, Ha-Ra struggles and winces because of the pain in her elbow. Do-Chan helpfully offers to clean them for her and jokes that she is ordering him around more than necessary. Smiling, he agrees do it for her anyway. Meanwhile, Jo Sung-Doo reports to Tae-Woong that the money was deposited for the cars and that the taxes were low because the cars are used cars. Instead of reporting them now, Tae-Woong tells Sung-Doo to take the money and transfer it into bank cheques. 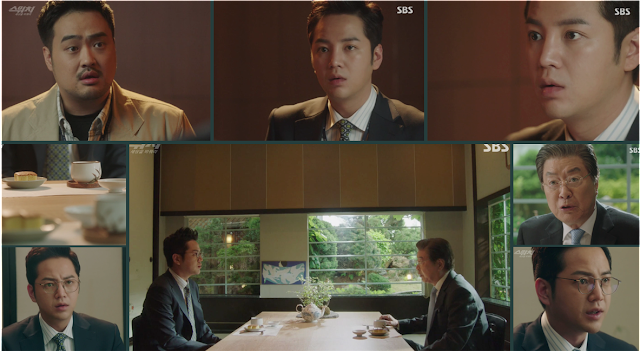 Sung-Doo questions Geum as bank cheques are traceable, but Geum continues, demanding Sung-Doo takes the cheques to Gangseon Land and gamble with them. Sung-Doo, protesting that he has given up gambling, is ignored by Geum. Tae-Woong tells Sung-Doo to meet Director Song at the casino and that he will teach Sung-Doo to gamble legally. Pointing his finger at Sung-Doo, Geum orders him to do as he is told. Ha-Ra finally return to work with her arm in a cast and is cheerfully greeted by everyone. She tells them that she has to catch the guy that broke her arm. When Ha-Ra asks about the task in Busan, Officer Lim fills her in on the apartment that Tae-Woong said he is giving to Kim’s mother. It is definitely worth two hundred million dollars; however, the house is not in the mothers name. As soon as the house was purchased, several liens were put against it, all in names belonging to employees of Feel Gallery. Geum purposely deceived Kim and can take back the house anytime he wants. Officer Lim tells her that, despite being criminals, they too work hard and do not sleep. At this point, Investigator Go arrives with the phone records. He rapidly discloses that manager Kim was near the K Savings Bank when the president died. Ha-Ra instructs Go to bring Kim back in for questioning. In a vacant parking lot, Sung-Doo meets with Director Song from the casino. After seeing Song the bank cheques, Song requests Sung-Doo go with him. Geum Tae-Woong soon receives a phone call, informing him that the bank cheques have now been converted into cash. Geum instructs his driver to head to the casino, with a truck following close behind. Observing from a safe distance, Director Bong, In-Tae and Eun-Ji tail the men in their Asian Refrigerated truck. After Geum Tae-Woong arrives at the warehouse, In-Tae taps into the security cameras. They watch as boxes are loaded into Geum’s truck, astounded at how much money they are seeing pass before their eyes. In the interrogation room, Do-Chan and Ha Ra show Kim the phone records, proving that he was in the vicinity of the bank when the president was killed. Do-Chan tells Kim that they also have a witness who saw him, so remaining silent will not help Kim at all. Ha-Ra then unveils the details of the house that Geum promised Kim for his mother. Although Kim’s mother is living there, she does not own it. As Kim looks at the contract, Do-Chan explains that Geum used Kim’s mother as a hostage to insure Kim's silence. The prosecutors continue to explain to Kim that Geum is still able to control him even in prison and will continue to do so if he doesn’t stand up and speak. They tell him to look at what Tae-Woong has done to him after he has given his life to Tae-Woong. Geum has already replaced Kim and will continue to do so, all the while telling the replacements they, too, are like a son to him. Looking down at the table while squeezing his hands together, Kim is overwhelmed with emotions of anguish and fury. He suddenly lifts up his head and looks at Ha-Ra and Do-Chan, saying, “I have conclusive evidence.” He adds that he will tell them where it is on one condition: that his mother be moved to a safe location. Ha-Ra agrees and assures Kim that they will keep his mother safe. Do-Chan’s mobile rings; it is In-Tae alerting them that Geum collected the money and is on the move. Wanting to catch Geum red-handed with the money in his possession, they inform Yang who hands them a search warrant. Yang tells them to get the money right now! Run! Director Hwang from Internal Affairs checks in with his officers about their progress. They report that there are plenty of suspicions and speculations but there is no hard evidence to prove there was any conspiracy. Hwang receives a phone call which he relays the instructions. Despite having no evidence, they are to bring Ha-Ra and Joon-Soo in for interrogation. Ha-Ra, Do-Chan, Go, Lim and their team of offices proceed down to the foyer of the building. At the same time, a group of officers from Internal Affairs climb up the stairs to the foyer, with the intention of taking Ha-Ra and Joon-Soo in for questioning. Both groups face off in the lobby. The internal affairs team declares to Ha-Ra and Joon-Soo that they are suspected accomplices of Sa Do-Chan's and must accompany them. Despite Ha-Ra telling them that they need to serve a warrant urgently, the internal affairs team claim their internal investigation is more important. If they are discovered to have assisted Do-Chan, then any of the warrant will be annulled. Meanwhile, Chief Yang receives a phone call about the dilemma in the foyer and immediately heads down from his office. Familiar with Director Hwang, Yang is furious at his arrogance and upon seeing him in the foyer, Yang yells at Hwang, demanding to know what he is doing. After a yelling match between the two, Yang tells his team to go now, that he will take responsibility. Yang puts his hand on one of the internal affairs officers to push him out of the way and orders Ha-Ra and her team to leave. Run! The team leaves. Ensuring this was not just a ploy, Hwang points to Yang and asks if he is certain he will be responsible to which Yang agrees and says he will quit. Geum and the delivery truck arrives at Feel Gallery just as In-Tae and the others observe on the surveillance cameras from their truck. The prosecutors arrive there just as the crates of money are being unloaded. Tae-Woong asks what they are doing there, but instead of replying, Ha-Ra tells Tae-Woong they have a warrant to search the truck for the money. Do-Chan shows the warrant to Geum, who presumes to have no knowledge of what they are talking about. Investigator Go and the officers start unloading the crates. As Do-Chan removes one of the lids, he and the others are mortified to see two Napa cabbages in the crate! Hoping that the other crates did not contain the same product, they quickly remove more lids, only to find more cabbages. Ha-Ra, seething, looks at Geum and asks how achieved this switch. Tae-Woong tells them that he got bulk Napa cabbages while in Gangwondo; do they want to confiscate them? While Do-Chan searches his thoughts on how Geum had achieved this swap, Ha-Ra again asks Geum how he managed this. All Geum Tae-Woong does to reply is smile a victorious smile.